India crushed the world champions to win the second test and go one up in the series. The Indians will be really pleased with the win as this was a total team performance and was not achieved on a typical dust bowl. Almost everyone in the team contributed to the win with Dhoni brilliantly leading from the front. Dhoni had temporarily taken the responsibility of captaining the team in the absence of injured Kumble and proved that he is ready to take over the reigns when the great leggie steps down. 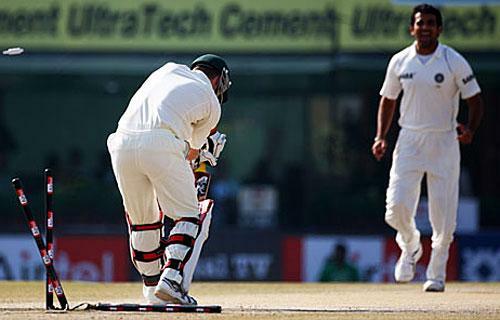 The Indians dominated the proceeding starting with the toss on the first day. A great start by the openers, fantastic century by Ganguly, good batting from Sachin and Dhoni made sure that India got to a competetive 469 in the first innings. Sachin and Sourav both reached singnificant landmarks during their respective knocks in the Indian first innings as Sachin became the higest run getter in tests and Sourav passed 7000 test runs. The Indian bowlers complemented their batsmen splendidly by bowling out the Australians for 268 giving a lead of 201 runs. Zaheer and Ishant were impressive at the start with Mishra and Harbajan running through the middle and lower order. Amit Mishra had a fantastic start to test cricket grabbing 5 wickets on debut. He finished with 7 wickets in the match and seemed ready to take over the baton from Kumble whenever he decides to call it a day. The Australians chasing an impossible 516 for a victory after yet another great batting display by the Indians in the second innings collapsed to a dismal 195 to hand a 320 run victory to the host. Ishant and Zaheer again among the wickets with Harbajan and Mishra combining well again in the second essay. Australians though will be really dissapointed with their performance as none of their top order batsmen were able to stay long enough to string a partnership and their bowlers were clueless against the aggressive Indian batsmen. All in all it was a excellent display by the Indians to go one up in the series. It seems like Kumble will be back in the third test which means that Mishra would not be playing. Mishra has taken a gaint step towards the Indian test team with his performance which will stand him in good state once Kumble decides to hang his boots. Even though the Indians have handed the Aussies their largest defeat in over a decade, they should not let complacency to set into their games. The Australians are still the number one team and it requires just one good innings or one good spell to reverse the situation for the visitors. Indians should continue their same ruthless approach in Delhi too and make sure that the series is won when the reach Kanpur for the final game.